In 2007, Royal Mail issued a set of stamps commemorating Britain’s Formula One greats. 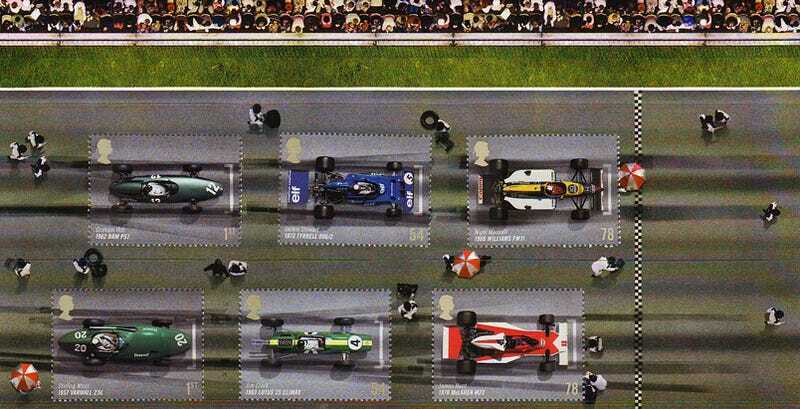 With six slots for eight world champions and Sir Stirling Moss, the stage was set for a philatelic battle royale. Stamps, then. The last time I dabbled seriously in stamp culture was in elementary school. I had stamp books aplenty. The family bathroom would be hijacked for hours as I placed slightly wet sponges on letters and postcards my family had received and stashed over the decades. Traveling one square inch at a time. To the Cayman Islands, to Ghana, to Botswana. To wherever. Formula One back then was epic and brutal battles between Ayrton Senna and Alain Prost, riding their McLaren–Honda MP4/4’s to victory in 15 out of 16 races, faltering only in the House of Ferrari one month after Enzo’s death at the age of 90. I did not follow Formula One back then. Sauropods and the woodlouse Porcellio scaber were infinitely more interesting. Nineteen years later, Royal Mail—the postal service of the United Kingdom—issued a set of six stamps commemorating Britain’s Formula One greats. It was the summer of 2007 and Britain had already given the world eight world champions, more than any other nation. Lewis Hamilton would eventually become #9, but not in his rookie year of 2007, oh no. In his rookie year, he was so busy trying not to beat but to bloody vanquish his teammate Fernando Alonso at the penultimate race in Brazil that he handed the championship to Kimi Räikkönen. This was back when, unlikely as it may sound today, Stirling Moss called him a humble young man, reminiscent of his 50s teammate at Mercedes-Benz, five-time world champion Juan Manuel Fangio. Six stamps, eight British world champions at the time of publication, plus Moss. So who got the axe? Mike Hawthorn, Le Mans champion and the first Brit to win the Formula One world championship. John Surtees, the only man who have became world champion on both motorcycles and in F1 cars. Oh, and Damon Hill—but then he makes people throw up. And why? There is no why. At least Royal Mail has no why. Mysterious are the ways of philately. Photo Credit: Lothar Spurzem (Graham Hill), Daimler Media Services (Stirling Moss and Denis Jenkinson), Royal Mail and the author. Special thanks to Lili Mesterhazy for the stamps and the postcards.